“I don’t tell secrets. Secrets are meant to be stowed. Tended. Carried. Well, maybe if you’d fished me and my boat out of the drink, lent me a down vest and warmed me up with a little riverside fire and whisky. Or maybe if we’d been hard-hauling, had blisters to show, had thrashed out some testy disagreement on which route to take, had reconciled in a long silence of rhythmic steps and were finally hanging out on a peak decked out with a galaxy or two spinning by. Or maybe if we were a couple weeks into the coltish lilt of this river and after a few days of rain our wool was finally steaming in the sun, our backs on warm rocks, our eyes closed, the silt hissing nearby. Maybe then I would leak a secret or two. When you fly into NahʔĄ Dehé, the South Nahanni River watershed, a 34,000-square-kilometre ecosystem in the Northwest Territories within the traditional lands of the Dehcho and Sahtu peoples, the most direct route from Fort Simpson, N.W.T., if the weather is good, reveals the boreal plains giving way to the ragged folds of the Mackenzie Mountains. In 10 years of guiding on the river, I’ve flown this stretch — landing sometimes at Virginia Falls, sometimes farther upstream at Rabbitkettle Lake, sometimes at the headwaters known as the Mooseponds — at least 30 times. Each trip, with my face pressed against the plexi and the fuel fumes wafting in the Twin Otter’s back door, the land sails below — the ramparts and canyons, the high plateaus and twisting valley streams, the shales and the sediments layered up and buckling crazily. The muted light, the kind that shines through a bird’s wing, shimmies over the brokenness. On each flight there’s a pang of what’s left behind: some unfinished work or promise not kept, maybe an unpaid bill or two, my lover who I already miss, maybe a friend who called last night drunk and hurting, my mom downcast with worries, a loved one who is sick or dying. I’ll keep the details to myself. Engulfed in the shudder of the engine, I watch the land roll out like a thick, rumpled blanket and I’m swallowed by a sudden wooziness, as if a drug is pouring into my veins and easing me into weightlessness. Time slows. Faces recede. I can’t remember anything I cared about moments ago. It’s all meaningless now because the forces that rule the land below happen on a very different scale. We are descending into this limitlessness. The land is immense. Immutable. I can try and make sense of this. 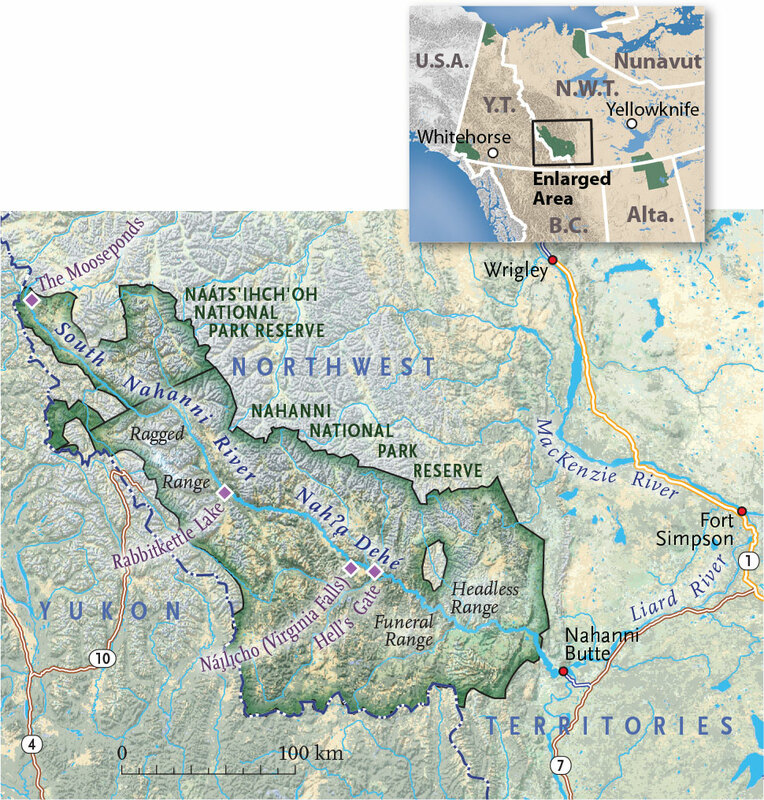 A good part of this watershed wasn’t glaciated in the last ice age. The Western Cordilleran ice and the Eastern Laurentide ice that covered the rest of Canada’s landmass never quite met and so the dramatic canyons and karst formations in the lower part of the Nahanni watershed weren’t scoured down. Scientists think that the Dall sheep in this area likely have a distinctive genetic structure because they were isolated during this time. This is an ancient land. The river was here long before these mountains. Before the heaving forces lifted the land, it meandered, like prairie rivers do. And by some wonder of gravity and abrasion, this lithe rope of water maintained its course as the mountains rose up around it. Most mountain rivers run fast and straight, but this river winds across the grain of the ranges. 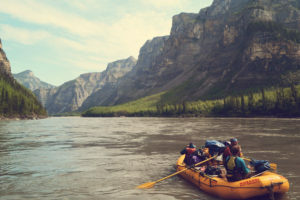 Down on the water, it always feels strange how the Nahanni snakes these fat s-bends, heading straight for a soaring wall, then veering madly in the opposite direction. The old cliff walls of meanders carved millennia ago sometimes loom more than a kilometre above. So this land is not really immutable. It’s changing massively, just slowly. If you want to understand something about this, I suspect you need to stay awhile. Hunker down. Think of the time scale. Think of the forests of coral, brilliant as candy, translucent filaments waving in the shallow seas, steadily building the skeletons now crushed together to make these towering limestone cliffs. Or the batholiths of the Ragged Range lifting 200 million years ago from the Earth’s core, sending a ripple of uplift still rolling out even now. It’s a whispered secret that’s hard to take in — one’s own insignificance in the face of the eons of the Earth. Oh sure, I’ve spent whole summers here. I’ve made the people I’m travelling with ditch their watches. We’ve moved according to the weather, the slow arc of the sun and the pangs of our bellies. But that’s a beginner’s lesson in time. In the failing light of a September sun, when the water is low, it is possible to sit on a small ledge at the brink of a churning 92-metre drop — Nàįlįcho. In the Dene tongue, the name for what the maps still call Virginia Falls means “big water, falling.” But this translation doesn’t do it justice. Spray wafts up. The thunder shudders bass notes into your lungs. You might never move from this place. You feel ancient as rock. You feel as if you’re falling. This might be a place of healing. Or it might be a place that roughs you up. You might never again be sure of anything. Nàįlįcho means big, as in unfathomable and sacred and deeply mysterious. Nàįlįcho means falling, as in headlong and plunging into deepest love, cascading with wild, deadly force. Nàįlįcho means water ever to be revered as we drink it down. This is my take. The Dene people who I’ve met on this river have always been incredibly generous with their knowledge and their stories. These stories are not mine to tell. But if you visit this land it’s worth listening to the people who know it best. When they share the name of a place and its story, you know you’ve been given a gift. But don’t kid yourself. They know how to keep their secrets too. 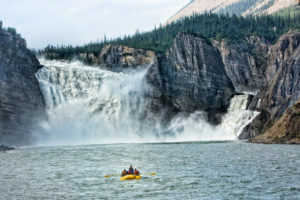 after bombing through the pounding waves of the eight-kilometre-long Canyon Rapids, making it through Hell’s Gate and then the wicked surges of Wrigley Whirlpool and Tricky Currents, the whitewater calms but the river still pushes as it enters a 40-kilometre-long canyon through the Funeral Range. Whenever I pass the braided tributary just before the start of the canyon, I think of May Lafferty, who went missing around here. I imagine her muscled arms hugged around her scuffed knees and the aspen shiver of her slender shoulders, her loose, serrated hair blowing in her face. But she doesn’t move to brush it away. She is staring off. And I wonder what is the last thing to hold her steady gaze before delirium landslides in. The Nahanni country is legendary for its murders and disappearances. Most of these seem to involve men and gold, greed and revenge. But it’s May who shows up in my dreams, never speaking, moving with the softness of lynx paws on snow. Not much is known of this young girl except that she was out hunting with her in-laws deep in the backcountry. They say she began acting strangely and then disappeared. A crew of local trackers — Yohe, Diamond See, Big Charlie — were called in to follow her vanishing trail over the rough terrain. Over and over, her track would disappear, at a cliff edge or on the banks of a rushing stream too swift to cross, and again and again, they’d pick up her faint trail farther along. Here and there they found pieces of her clothing, until she must have been moving completely bare and vulnerable. The branches rasping against her shoulders. The trembling wind. Her feet sleeting over the shale ground. What grief or illness was driving her? What memory was on replay in her mind? What was shattering like the frostbroken rock? The tributary named after Lafferty is called Ts’elį Ets’odéhtlah Dehé, meaning “little girl lost creek.” This vast land is a place where you can vanish. Perhaps that’s not so different from the downtown streets of any big city or the lonely bedrooms of any suburb or small town. But sometimes I wonder if we come to this place because we want to to disappear, to escape the secrets of our lives. I remember one early June, the river thick and silty, flowing high with spring runoff, and as I rounded the bend I looked back to see six red canoes strung out behind me. I looked at the rapid coming up: everything was different. The island where we usually stopped to scout was gone. A whole island. Disappeared. Just swift flowing water. So we paddled hard for the nearest shore, and then as my bow paddler tried to hold the nose against the eroding cut-bank and fight the current, I jumped out. The bank crumbled and I slid into the fast water, trying to get a footing. I was swimming at one point, the rope now a deadly coil near my feet. This rip of current was not the place to land. And if we couldn’t land, we might all be swept through a pounding rapid that piled into a headwall before deflecting around the corner. Somehow, I managed to pull myself out and we got the rest of the boats landed. With time to look around, I realized that the river had completely changed. The island and its stand of poplars was gone. The main current now pushed farther right, easing around the bend. The rapid was washed out. And so we got back in our boats and calmly paddled through. I felt ridiculous trying to explain how urgent it had been to pull off river when now there were only standing waves to be seen. 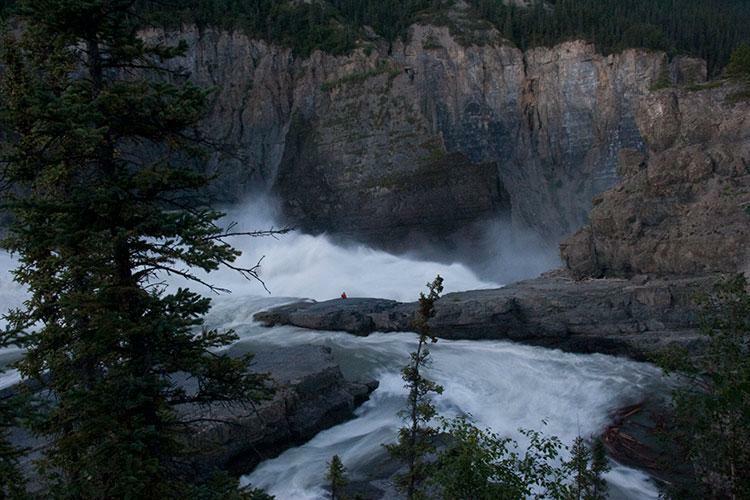 The river’s flood had wiped out a rapid that had been Nahanni legend for as long as current human memory serves. The river has a shifty nature, cutting on the outside of the bends where the current is fast. It shaves away the bank, leaving a thick layer of moss and roots weeping down and trees leaning precariously as their ground gets cut away from below them. And on the inside of the corners, as the water slows, it drops its load. The river, sorting what it carries, ever swaying this way and that, a slow dancer. Sometimes I lie back with my feet up on the gunwales, letting the canoe twist in the current. And in the sky the clouds, swollen and doped, gather themselves and give themselves away, gentle as alms pressed in the hand. On the shifting islands, the silver dryas flats shimmy with full-blown seedheads like choirs of hobos who’ve been given the same song. I remember the time a grizzly’s shoulder brushed the fly of my tent and I heard its breath. And I remember the wounded moose floundering to pull itself out of the river. And the flies on the delicate blue line of its eyelid when we found it washed up the next day. This article was originally published in Canadian Geographic in 2013.